The epidemic of barn fires continues in Canada. In just 16 days, a total of 5 dairy factory farms across Canada have had their barns go up in flames, sentencing hundreds of animals to horrific deaths. The rash of fires started on June 14, when a dairy barn in Courtenay, BC was destroyed by fire, leaving many animals burned. One animal was left to suffer for hours before finally being euthanized by a veterinarian. While this animal was reported to the media, local sources report that the death toll was actually much higher – as many as 68 animals, some of whom may have escaped the farm with horrific burn wounds, may have died. Ten days later, on June 24, another dairy farm, this time in La Presentation, Quebec, caught fire. 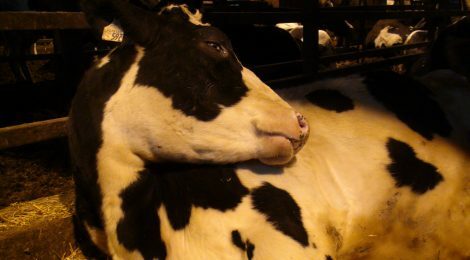 It is estimated that 80 cows burned to death. Just 2 days later, on June 26, 3 dairy barns burned North of Moncton, NB. Thankfully, no animals were in the barns at the time of the fire. Again 2 days later, on June 28, another dairy factory farm, this one in Abbotsford, BC, went up in flames. 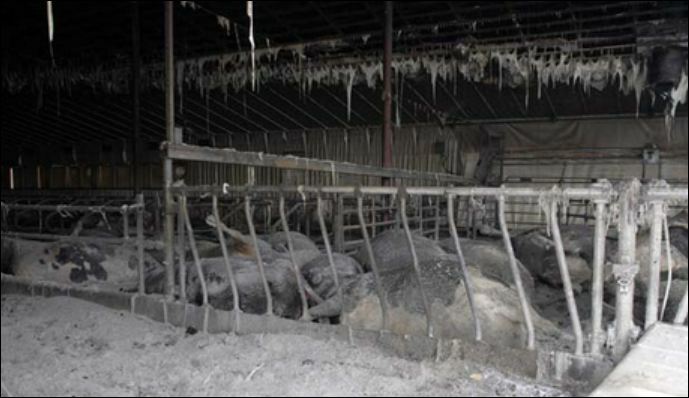 400 dairy cows were burned to death. And one day later, on June 29 in Green Oaks, NS, an entire milking herd burned to death, although no numbers were released to the press. While the barn fire epidemic rages on, industry continues to look the other way. The National Farm Animal Care Council – the body that represents the livestock industry and has the authority to protect farmed animals from barn fires – has failed to take any corrective action and refuses to develop a barn fire code to prevent and reduce the occurrence of barn fires. In spite of the call from nearly 30,000 Canadians, NFACC has failed to protect farmed animals and prevent this needless suffering. Their inaction is unacceptable. Sign our petition today and urge NFACC to do its job and protect Canada’s farmed animals.